Every sound in this language produces a powerful vibration which, when combined with other sounds to produce specific words and phrases, bestows nourishment to the one who chants. Said to have originated and developed in the Indus River Valley of what is now Northwest India and Pakistan, Sanskrit is one of the oldest languages known to humankind. Its unique power of and beauty reflect the great importance that sound had to the ancient sages. Sanskrit was originally an oral language, which is perhaps why it is such a lyrical sound. By around 4000 BCE Sanskrit had developed written expression and became one of the many cultured languages of India. The great philosophical and historical texts were all written in Sanskrit and the sheer volume of Sanskrit literature is immense. A unique characteristic of the Sanskrit language is its precise pronunciation which is found in five locations in the mouth. Every sound or syllable is located at one of the five mouth positions. The beauty of the sound is directly linked to the sensing of the vibrations created when intoning as little as a single letter of the Sanskrit alphabet. The language of Sanskrit uses an Indic alphabet known as Devanāgarī . Chanting is to intonate a syllable, phrase, or slogan rhythmically and repeatedly for the purpose of producing a specific result. It is a vocal expression of one’s intention to align one’s mind and body with the eternal aspect of consciousness which is sometimes referred to as the Divine, God, or Brahman. The Sanskrit vehicles for chanting are sacred prayers or hymns called mantras. Many of them are thousands of years old and are regarded as an auspicious means of communicating with one’s chosen deity. The chanting of Sanskrit mantras emerged from the oldest known written texts in Sanskrit, which are named the Vedas. The Vedas express the philosophical questions and concerns of the day, through hymns. Before writing was developed, these texts were preserved by careful teaching of the chants and prayers through recitation, repetition, and refinement. Strict rules of chanting were put into practice in order to insure accuracy in the preservation of these texts. These strict rules are observed even today, and this art of Vedic chanting thrives as a result. “People come to chant by many different paths and for many different reasons. For some, it is spiritual, a form of devotional prayer; for others it is a method of relaxation. Still others use chant as a meditative avenue to self awareness, while some find in the practice a unique social connection.” – Paul Santos: CD: “Planet Chant”. This learning program has helped many students of yoga successfully access their own chanting voices. 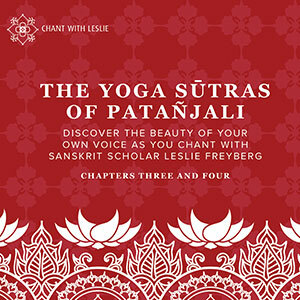 You will too! In the Learn with Leslie portion, Leslie guides you through her proven method for learning to chant the yoga sūtras. In the Chant with Leslie section, Leslie chants the entire chapter through, for you to follow along or simply listen. Bonus tracks: sung sūtras and rich verses to delight your spirit. A unique gift for all yoga enthusiasts! “I’m happy to report that my purchase of the CD sets has inspired me to redouble my efforts at pronunciation and memorization of the sūtras. While I appreciate the instruction that is provided in class, I can’t seem to absorb the information quickly enough. The ability to review each sutra repeatedly is a huge help. My fantastic new Leslie Freyberg CDs are paced in a way that helps me capture the details that have been eluding me thus far.